Ultratone K900FX, Keyboard Amplifier from Behringer in the UltraTone series. 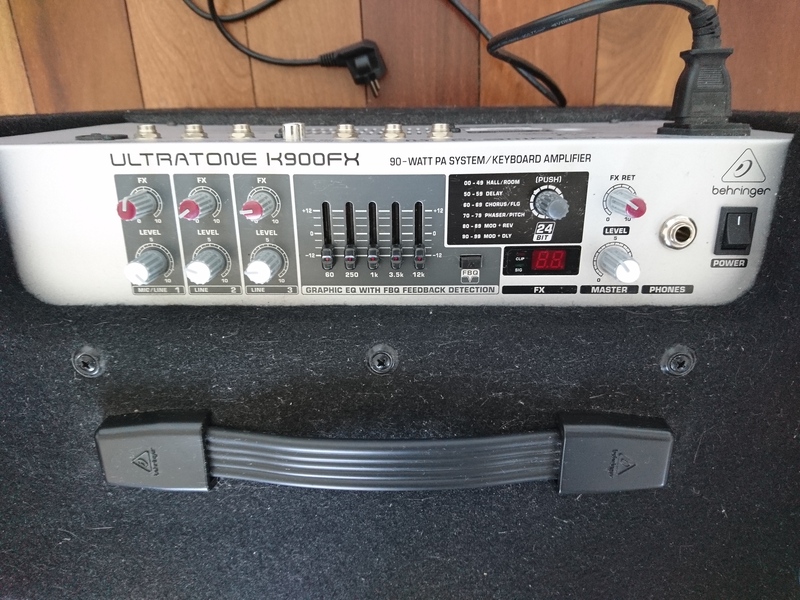 sw80's review"Effects, 5 Band EQ and a Crisp Sound"
The Ultratone K900FX is a 1 x 12 keyboard amplifier that has 24 bit digital FX processing with over 100 presets to use. This was the main reason for me even choosing this amp. I was in a local music store looking at the amps and came across this one once I notice it had all of the effects on it I was pretty much sold. 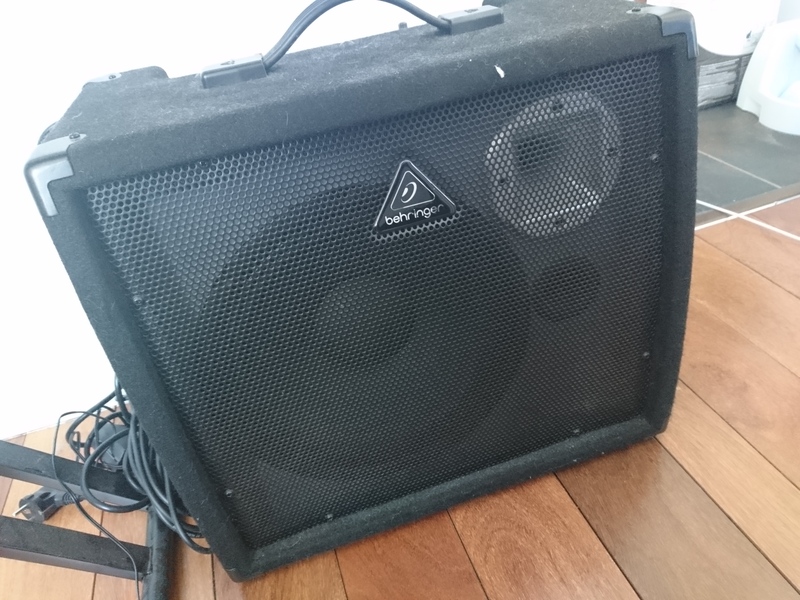 I have even used this amp to do some small gigs with and never had a complaint with it. I would not use it in a larger room for a gig though because I do not think it is powerful enough. I also liked how I could plug in a microphone (dynamic) right into the amp to use for my vocals. You can even put your CD’s into this amp and use it as backing music or just to play along with your favorite songs. I put on a pretty awesome show for a local Elementary Schools music classroom with this amp and the kiddies loved it. I really liked the delay on it and the pitch shifter. I was able to do some really neat stuff between working with the microphone and my keyboard running through this amp. You can even mount this amp to a pole if you want, though didn’t have a pole so it just went on the floor. I do recommend having a good quality cord when using it because I noticed that cheaper cords don’t sound as good. This amp weighs around 40 pounds which is still pretty light; it is a 3 channel amp with a 5 band EQ built right into it! This was awesome, and I recommend this to anyone who is starting off with some really small gigs or is starting to take gigging more serious. The Ultratone K900FX has just about everything you need to work with from the EQ to the effects and microphone input, all at a good price! 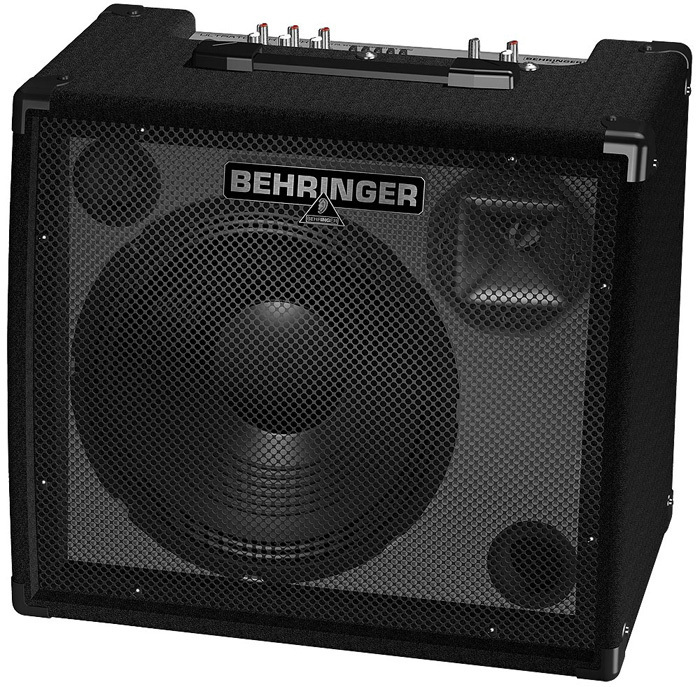 I have had some bad experiences with a few different Behringer amps over the last 10 years, so I really don’t purchase them anymore. But in a certain situation I didn’t have a choice but to use the Behringer Ultratone K900FX. It is a 90 watt 3 channel amp that can be used for your keyboard. The sub is 12” and the tweeter is only 1”. The price of this amp was the only reason I used it because I needed a quick cheap amp when I was in a tight spot so this was the one that I grabbed from GC earlier this year. I was actually surprised with how good it sounded and having the FX on board was a huge bonus because I didn’t expect that. The Behringer Ultratone has an XLR input, a Auxiliary input and a headphone output. For it to be a cheaper amp, it sure does weight a lot more than some of the other amps that I have used that cost more. It weighs 40 pounds and can be mounted to a pole for performances. I really enjoyed the way the Ultratone sounded with my keyboards and our guitar player used it as well for a short period of time. I was very pleased with the sound that it gave me for 250 dollars. Though we did not keep this amp that long, I do recommend it to someone who does not have a lot of money to spend on an higher end amp. It is very well built for it to only cost that much and has a very clear sound when turned up to the max volume. 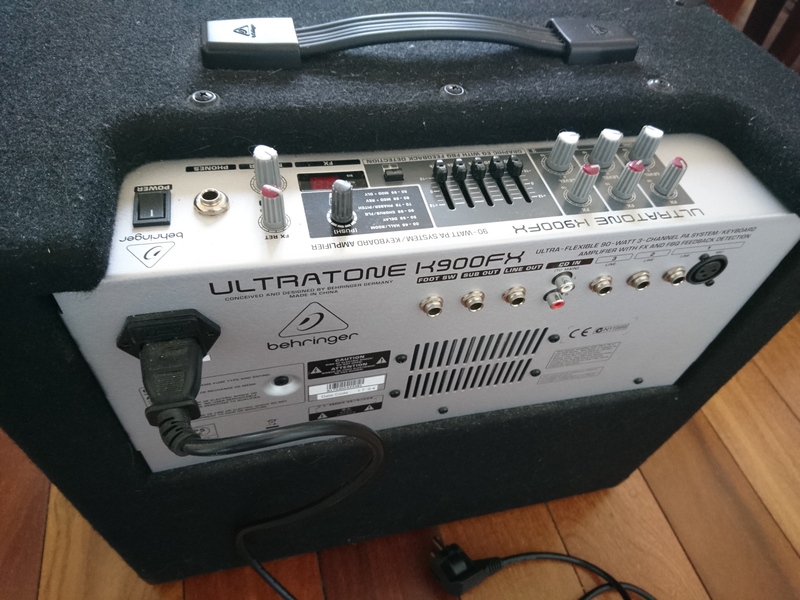 If I every needed a quick buy again to have an amp for a performance and didn’t have the money on hand to purchase a higher end model I would purchase the Behringer Ultratone K900FX again without a doubt. Behringer outdid there self on this one, I didn’t not expect this kind of quality out of such a low priced amp from them. Binuts's review (This content has been automatically translated from French)" Excellent Q / P and Versatile"
I chose this keyboard amp 90 watt transistors for private use (home and small concerts) and I really Reserved in power, I turn my home to a quarter of its possibilities. 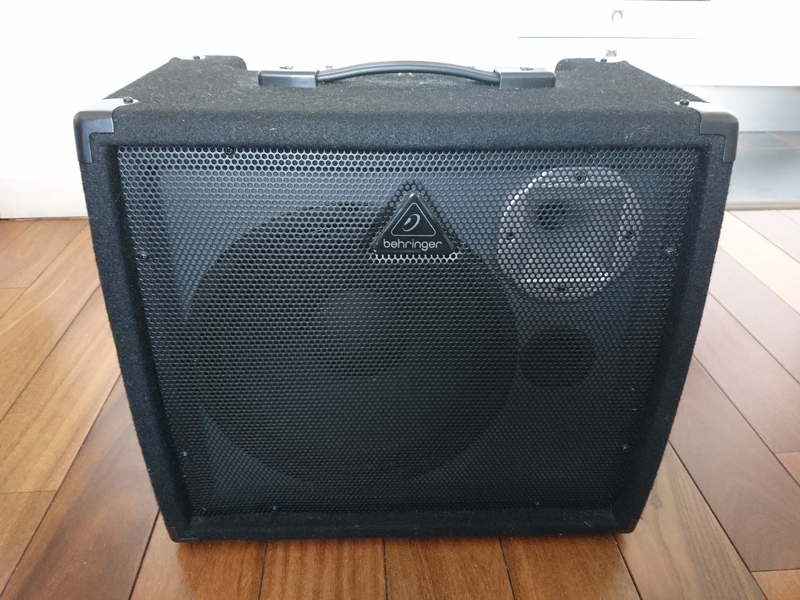 This amp seems sturdy and the finish is great for the price of trs own. It possde 4 channels between a direct mp3 or CD player and three Jack-type 6.35 with a channel coupled with an XLR (microphone). 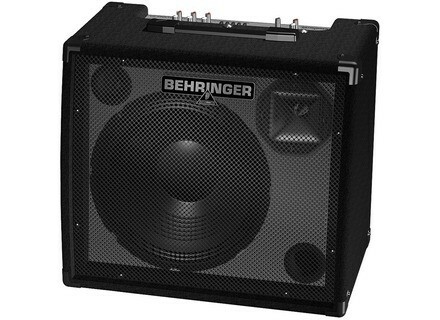 It is not important and can rev without behringer but could have added a link to add an output amplifier Ultratone 2nd K90 FX connectivity for Stereo but simplifies the selling price s' would be felt. The configuration and use of Ultratone K90FX is no one bit simpler "you branch and you're playing." He has five bands of legalization with feedback-detection diode light. After a first rglage performed over the place or you can play, does not return often then legalization. I have 2 keyboards connected the Ultratone K90FX, a ​​Korg PA800 and Hammond XK1 and the sound is always right even with trs trs any records of organ jazz or more kinds "Rock overdrivquot, sometimes serious or trs trs Aiges especially with the Hammond. I use my Ultratone K90FX for over 2 years and collection outdoor home and I have still not had any problem with. I find it really well but trs output to connect a 2nd K90 Ultratone FX t would welcome (but not well do without leaving a path through amplifier (Left & Right). Here is an affordable product trs cash big sound plus an excellent strength for me. The report quality price trs above average. I would do without this choice problem, I would take the same.